At the March 5th, 2019 council meeting, P4H member Hazara Price speaks in support of the rent cap and just-cause evictions. Click the photo to hear her address the council (view at about 8:50 mark of the video). Center of Hope’s PLAN4Hope quoted on pages 8-9 of the March Issue of L.A. Focus regarding the Inglewood housing situation. Click the photo to read the publication. Spread the word! The Uplift Inglewood Coalition will be hosting a free legal clinic for community members seeking legal advice with regard to housing on Thursday, February 28th at 600 Centinela Ave, Inglewood, CA 90302. Free legal consultations will take place between 6:00 - 8:00 PM. Participants must arrive before 7:30PM in order to receive free legal advice in regard to housing issues. You must register for the clinic ahead of time to see an attorney. Note: Legal services provided at the clinic are free but eligibility screening is required upon arrival. The City of Inglewood is circulating a form to find out about rent increases in Inglewood of 25% or more. Have you completed the questionnaire? Once you fill it out, let Uplift Inglewood know so that we can help hold our elected officials accountable. If you or someone you know needs help filling out the City's questionnaire or uploading documents, we can help! Drop by 600 Centinela Ave, Inglewood, CA 9am-5pm Monday-Friday. 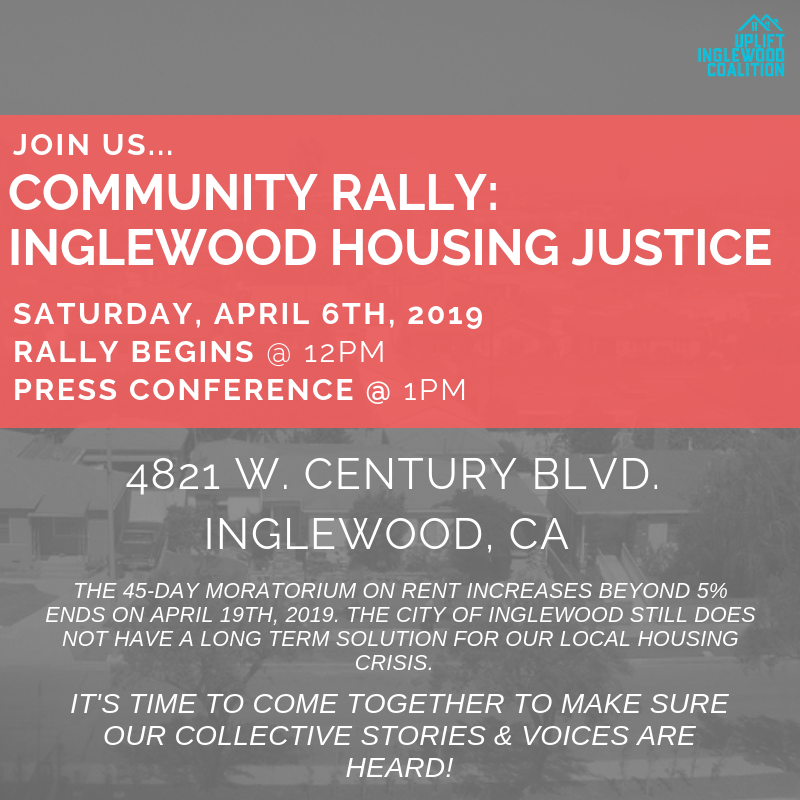 Please forward this email to anyone you know who may have received a rent increase in Inglewood. Por favor envíe este mensaje a los que han recibido un aumento de renta en Inglewood. What if each of us reached out to one person, got to know them, listened to their stories, laughed together and built a real friendship? What if we did this in the spirit of hope, dignity and love that all people deserve—no judgements, no expectations, but together as equals? And then what if we brought the collective knowledge of all the partners we know from the Carnival of Love to help our friends improve their lives? This program will be a game changer for our neighbors on Skid Row and will change lives on both sides of the colon. All we need now is 100 people in Los Angeles to sign up for one amazing year of friendship, dignity and love. Click the link below to receive the notes from this very informative Summit. Looking for a place in Inglewood that fits in your budget? The Affordable Housing Division of Inglewood can help.